MUA is one of the few programs founded on the concept that immigrant women themselves are uniquely equipped to find solutions to the problems that most directly affect their lives. 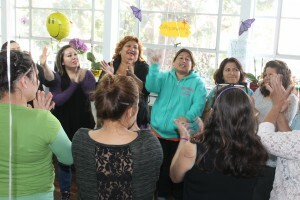 MUA’s direct service program is rooted in this philosophy by ensuring that the services we offer – individual and group counseling, support groups, referrals and accompaniment to other community resources, domestic violence and sexual assault intervention, and workforce development programs – are offered and implemented by Latina immigrant women. MUA draws on the strengths of our community members to serve as peer mentors, group facilitators, community educators, and counselors. Latina immigrant women gather daily in MUA’s San Francisco and Oakland offices to discuss the urgent issues of the day: immigration laws that change seemingly overnight; increasingly widespread unemployment and denials of basic workers’ rights; and cutbacks in the education, healthcare and social service systems. With their chi ldren playing nearby, MUA members share stories of how this political context has led to family tensions, increases in domestic violence, and varied fears about the future. This scene is similar to others being played out across the Bay Area and around the country — as immigrant communities face unprecedented attacks and as immigrant women bear the brunt of these numerous affronts. In MUA, however, the scene is different. While discussing their concerns, MUA members are simultaneously building alternatives—healing themselves and each other, learning to organize and speak out, developing new economic development strategies, and raising a clear voice from the grassroots that Latina immigrant women are a powerful force for change.